A tumultuous week for Secretary of Defense Donald Rumsfeld did not end on a quiet note as prominent military and political leaders debated his future on the Sunday morning talk shows. Some influential retired generals have called for Rumsfeld to resign his post because of his abusive leadership style and strategic failures in the war in Iraq. But, President Bush, the current Pentagon leadership and other former military officials have launched a counter-offensive in support of the Secretary. Retired General Richard B. Myers said on Sunday that Rumsfeld did not intimidate members of the Joint Chiefs of Staff during planning of the Iraq war as some others have charged. Myers, the Air Force general who was chairman of the Joint Chiefs until last fall, also dismissed criticism that military leaders failed to stand up to Rumsfeld and Mr. Bush when the military and civilian officials disagreed. The Defense Department has issued a "Fact Sheet" to former military commanders and analysts that challenges the retired generals' criticisms of Rumsfeld, CBS News correspondent Randall Pinkston reports. The one-page memorandum was e-mailed Friday to a group of influential civilian analysts and retired generals who appear regularly on television. The Pentagon's office of the Directorate for Programs and Community Relations and Public Liaison distributed the "Fact Sheet," but it is unclear who wrote it. "U.S. senior military leaders are involved to an unprecedented degree in every decision-making process in the Department of Defense," the memorandum reads. It lists numerous examples of cooperation between civilian and military leadership within the Pentagon. 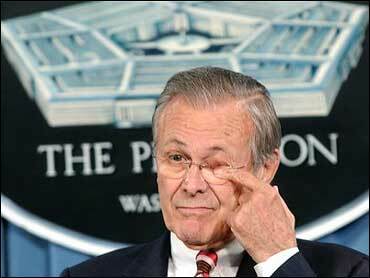 The "Fact Sheet" says Rumsfeld has had 139 meetings with the Joint Chiefs of Staff since the start of 2005 and 208 meetings with the senior field commanders. "Secretary Rumsfeld created new decision making bodies to ensure military judgment and perspectives are woven into all aspects of Department of Defense policy and operations," it reads. Many politicians are using the open criticism of Rumsfeld to step up attacks on him, the Bush administration and the war in Iraq. "My view is that the secretary should step aside," said Bill Richardson, the Democratic governor of New Mexico and a possible presidential candidate on CBS's Face The Nation. "Besides the fact that the Iraqi war has been mismanaged, that a lot of brave American men and women, over 2,300, have perished," he told Bob Schieffer. "We should listen to what these generals are saying." Senator Dianne Feinstein repeated the message on CNN's Late Edition, "I think the nation and this president would be well-served if there were a change of team." The California Democrat continued, "I think the problem with Mr. Rumsfeld is that he is very stubborn. He is very determined. I don't see the flexibility that a change of circumstances in Iraq which has been happening following the first three weeks of the military operation." A half-dozen retired generals have called for Rumsfeld's ouster, citing mistakes in the conduct of the war in Iraq. Some have suggested that intimidation by Rumsfeld kept military leaders quiet even when they thought policies were flawed. "You'd have to believe that everybody in the chain of command is intimidated, and I don't believe that," Myers said on ABC's "This Week." He added that Rumsfeld allowed "tremendous access" for presenting arguments. "In our system, when it's all said and done ... the civilians make the decisions," he said. "And we live by those decisions." President Bush on Friday brushed aside intense debate among retired military commanders for Rumsfeld's resignation, saying his defense secretary enjoys his full support. "Secretary Rumsfeld's energetic and steady leadership is exactly what is needed at this critical period," Mr. Bush said in a written statement. Sen. Richard Lugar, chairman of the Senate Foreign Relations Committee, said Mr. Bush is making "a good call" in retaining Rumsfeld. Facing a large agenda of foreign-policy issues, the president should not be distracted by operational disputes, said Lugar, R-Ind. Sen. Evan Bayh, D-Ind., who called for Rumsfeld to resign two years ago, said Sunday the issue now is about "the president's decision-making and judgment." Mr. Bush's inability to put more important concerns ahead of keeping Rumsfeld as defense secretary "is not healthy for our country," Bayh said in a joint appearance with Lugar on ABC's "This Week." "He went to war with a flawed plan. He didn't account for the hard work to build the peace after we took down the regime," retired Army Maj. Gen. John Batiste, who served as an infantry division commander in Iraq for 2½ years until last November, said Friday on CBS News' The Early Show. Also calling for Rumsfeld to resign were retired Army Maj. Gen. John Riggs, retired Marine Gen. Anthony Zinni, retired Army Maj. Gen. Charles Swannack, retired Army Maj. Gen. Paul Eaton and retired Marine Lt. Gen. Gregory Newbold.